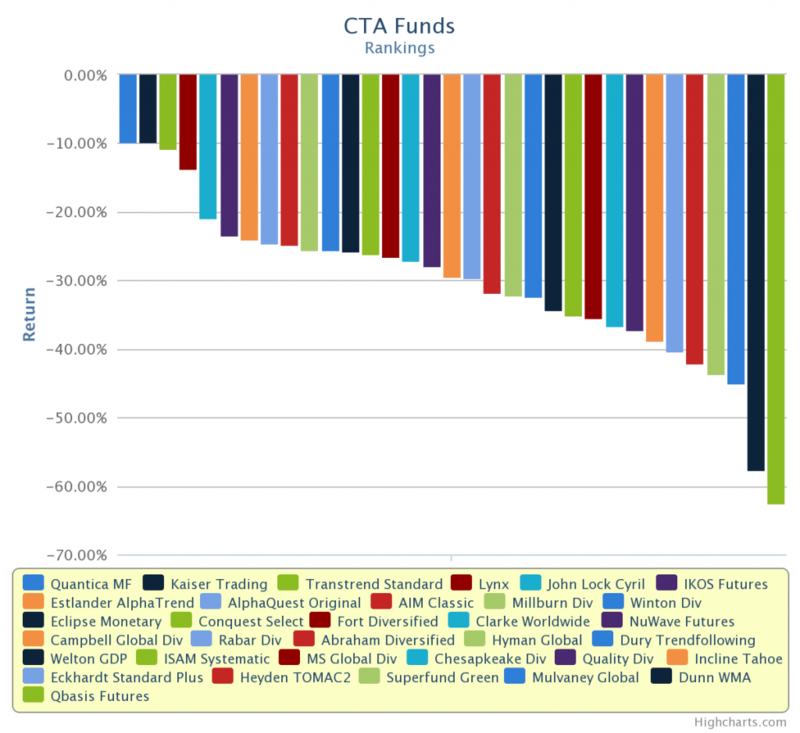 Last year saw a return to profitability for most trend following hedge funds. As I wrote a few weeks ago, the equity rally last year provided an excellent environment for long term trend followers. Those funds that are more geared towards equity markets did well and those with very long term horizon did the best. This also explains why the very same funds suffered the worst losses in January. While longer term trend followers stayed with the equity bull the whole way, medium and short term players got kicked around a few times along the way. Over the long run, the long term guys tend to show higher returns due to this phenomenon. Of course, they also tend to show deeper drawdowns at times. The medium and short guys probably got out quite early here. After the first big down move on January 24, a large amount of trend followers out there started reducing or got out all together. That drop was painful in itself. 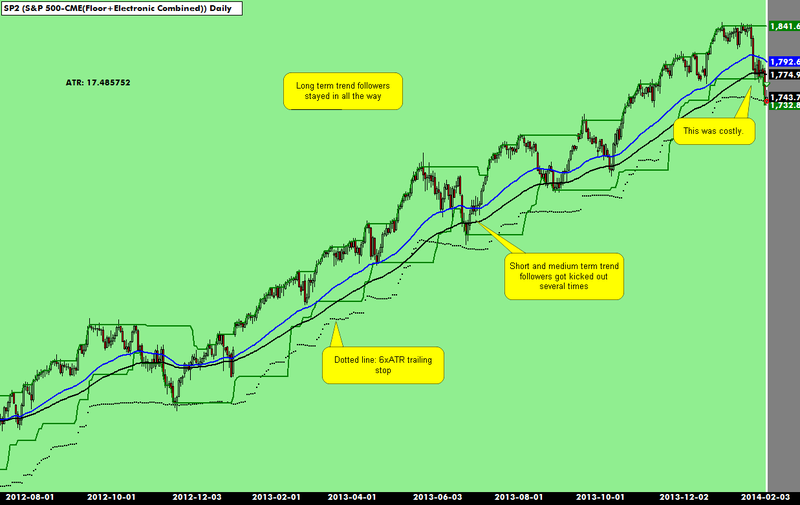 The longer term traders however are still in the trade as we speak. 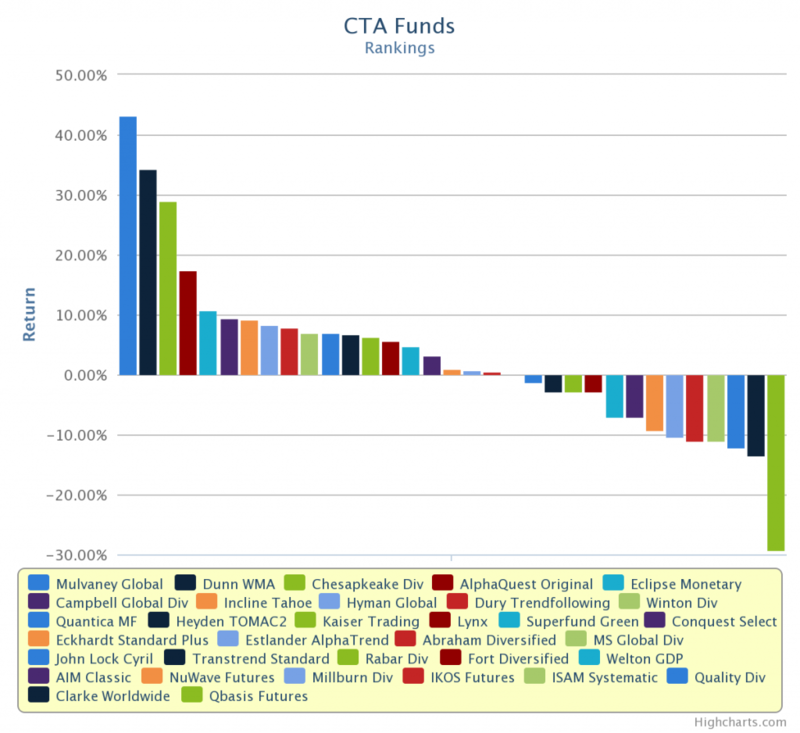 In the long run, CTA funds are not very correlated to equity markets. The reason that this is happening at the moment is that equities has been the main trending theme for the past half a year. When a sector has such a run, any sector, trend followers pile up risk in that sector. This is after all what we do for a living. Bet on whatever seems to be moving at the moment. For a while now, it has been the equity markets. The problem specifically to the equity markets is of course the internal correlation. Stocks tend to move up and down on the same day, all over the world and across all sectors. Sure, there’s a little variation. 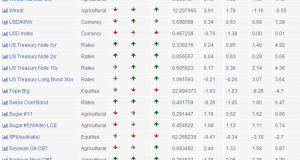 But compared to something like agricultural commodities, stocks look pretty identical to each other. Not all funds have reported yet, but the results are overwhelmingly negative so far. To the far left, one of the few positive performers in January you’ll find Fort. They are very fixed income oriented and should have been less impacted by the turn in the equity markets than their peers. The second one is Quest Partners, which has shown very interesting performance lately. 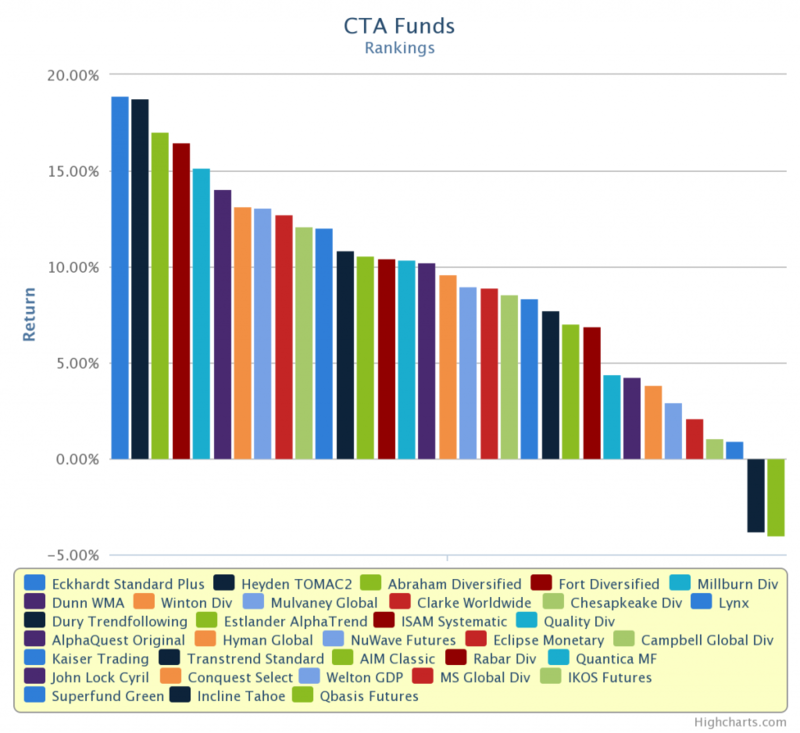 You can follow the development of these funds on our new CTA Funds Performance Database. The poor performance in January is however not very worrying. Equities had a great run and it was inevitable that they would correct. The problem is that you don’t know when. 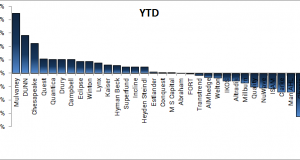 After the generally good performance last year, most funds are still showing good one year performance. Some may be disappointed that trend following hedge funds haven’t performed even better lately, given the strong equity rally. This is the curse of this industry. When the equity markets go up, investors expect you to beat the equity indexes. When equity markets go down, investors expect you to beat 20%. It’s tough to model strategies to achieve both. Over time, trend following strategies have massively beaten traditional investment approaches though. This strategy is about taking the long view. Anything can happen next quarter. But in a decade trend following will win. Take a look at the compound annualized return from inception for the trend followers. When you look at the chart below, keep in mind that the global equity markets have compounded at less than 5% over the past 30 years. To put these returns into context, you need to be aware of one more key figure. The maximum drawdown, from peak to trough, that the world equity markets have seen in the recent past has been close to 60%. There has also been several drops around 20-30%. And this is for the global indexes. Individual stocks of course suffered much more severe blows. 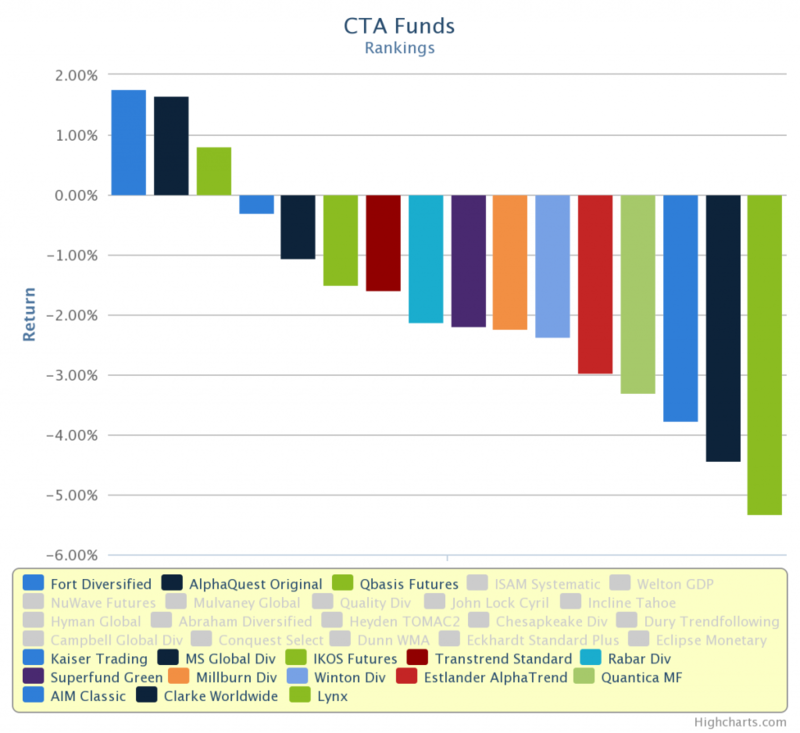 The final chart shows the maximum drawdowns seen by the same set of trend following hedge funds. Next: Global trends overview – Updated daily! Global trends overview – Updated daily! Apologies for site error. Fixed now.